-Linden: Stimulates microcirculation.-Vitamins A ,B, and E: Revitalize, soften, and protect skin. Water (Aqua), Sorbitol, Dipropylene Glycol, Oleth-20, Glycerin, Panthenol, Butylene Glycol, Propylene Glycol, Parfum (Fragrance),PEG-8, Alpha-Glucan Oligosaccharide, PEG-32, Lactic Acid, Carbomer, Tilia Cordata Wood Extract, Tocopheryl Acetate, Anthemis Nobilis Flower Extract, Bletia Hycinthina Bulb Extract, Retinyl Palmitate, Helianthus Annuus (Sunflower) Seed Oil, Phenoxyethanol, Methylparaben, Sodium Citrate, Disodium EDTA, BHT, Limonene, Linalool, Geraniol, Citral, Citronellol, CI 19140/Yellow 5. Last winter, I and a friend of mine were walking around the garosu-gill. which is the name of the street in Korea. Apparently the street is really hip and there are lots of shopping places and surely fashion lovers. Anyway walking around there and we found a Clarins pop-up store. They held pop-up store to celebrate their 60th birthday. They were also having an event to customers. So we just got there and a clerk told me and my friend which toner would be perfect for our skins and then give us some samples. So at that time, I was really impressed by this product in the picture. But I already had new products for skin care routine, I could not buy it. You know what? My parents visited Montreal recently. So, before they off to Montreal, I asked my mom to buy this camomile toning lotion and other one. I`ll post about the other one later. It is not always easy to try new thing for me. Because I tend to be stubborn with previous things I used. So, I was a bit worried about it. Actually, I asked my mom to get the Lancom ones but mom said it`s too expensive. ( Comparing with the price of what she got for me, it was not that expensive though..) So I`ve got new skin care routine with this camomile toning lotion. I was really wondering about the name of the product. Because usually when I imagine 'LOTIONS', I think of moisturizers. For that reason, this product does not look like a lotion for me. However, once you use this, you will realize that your face get more moisturized like a moisturizer. I am really sure that it`s perfect to who has dry skin or just needs light moisturizer like me. This product is totally different with Clinique's clarifying lotion. 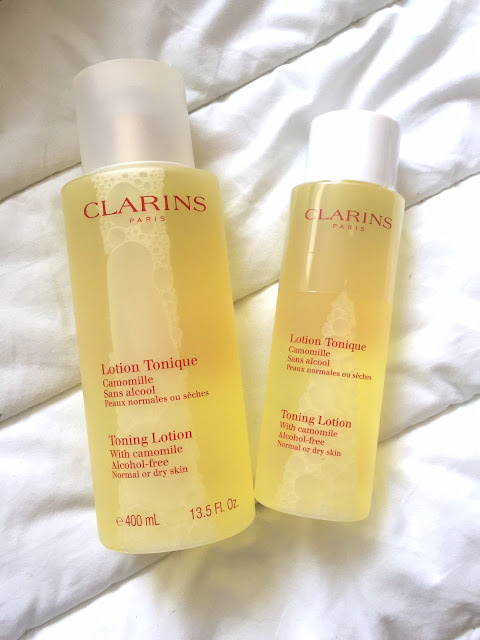 Clinique's one is more getting rid of all dirties on my face, but Clarins' one is more moisturize my skin. I think it would be better to use it after Clinique`s clarifying lotion.